during a research survey off the California Coast. 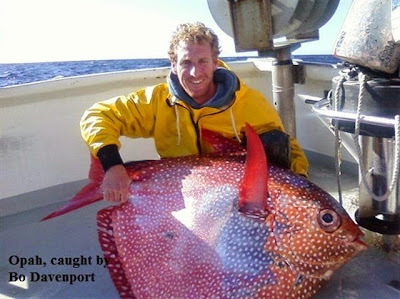 New research by NOAA Fisheries* has revealed the opah (Lampris Guttatus) to be the first fully warm-blooded fish. Also known as moonfish, it circulates heated blood throughout its body much like mammals and birds do, giving it a competitive advantage in the cold ocean depths. With a maximum length of 2 m (roughly the size of a large tire), the fish is known from oceans around the world, dwelling hundreds of feet beneath the surface in cold, dimly lit waters. It swims by rapidly flapping its large, red pectoral fins like wings through the water. Most fish that inhabit deep and cold waters are slow and sluggish, conserving energy by ambushing prey instead of chasing it. However, the opah's constant flapping of its fins heats its body, speeding its metabolism, movement and reaction times, and helps it maintain the entire body core above ambient temperature. "Before this discovery I was under the impression this was a slow-moving fish, like most other fish in cold environments. But because it can warm its body, it turns out to be a very active predator that chases down agile prey like squid and can migrate long distances." said Wegner. Wegner first realized that something was strange about the Opah when biologist Owyn Snodgrass, co-author of the study, collected a sample of gill tissue. Wegner recognized an unusual pattern, blood vessels that carry warm blood into the fish's gills wind around those carrying cold blood back to the body core after absorbing oxygen from water. This design is known in engineering as "counter-current heat exchange." For the moonfish, it means that the warm blood leaving the body core helps heat up cold blood returning from the respiratory surface of the gills where it absorbs oxygen. Much like a car radiator, this is a natural adaptation that conserves heat. The unique location where the heat exchange takes place allows the fish's entire body to maintain an elevated temperature even in very cold waters. "There has never been anything like this seen in a fish's gills before. 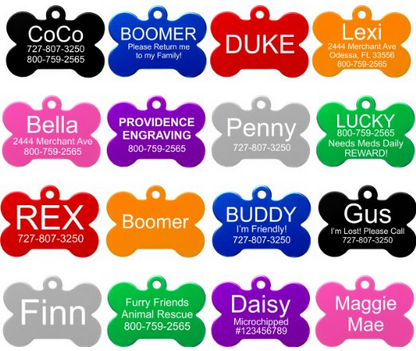 This is a cool innovation by these animals that gives them a competitive edge. The concept of counter-current heat exchange was invented in fish long before we thought of it." said Wegner. The researchers collected temperature data from moonfish caught during surveys off the West Coast, and found that in most cases their body temperatures were regularly warmer than the surrounding water. Furthermore, they attached temperature monitors to opah as they tracked the fish on dives to several hundred feet and found that their body temperatures remained steady even when the temperature dropped sharply. The fish had an average muscle temperature of 5 degrees C above the surrounding water while swimming about 150 to 1,000 feet below the surface. Lampris guttatus collected in the USA. Although a few other fish such as tuna and some sharks warm certain parts of their bodies (regional endothermy) such as muscles, boosting their swimming performance, internal organs like the heart cool off quickly and begin to slow down when they dive into cold depths, forcing them to return to shallower depths to warm up. 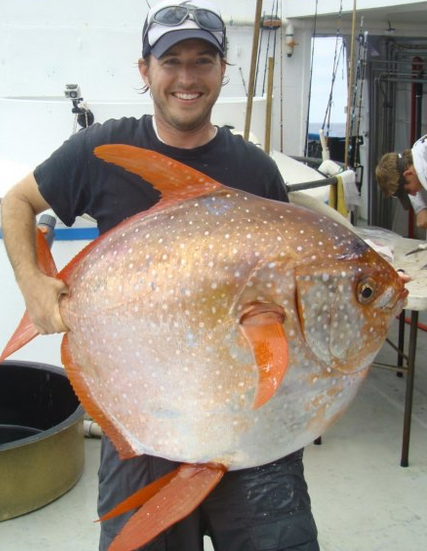 Unlike them, the opah is the first fish found to keep its whole body constantly warmer than the environment. "Nature has a way of surprising us with clever strategies where you least expect them. It's hard to stay warm when you're surrounded by cold water but the opah has figured it out." said Wegner. NOAA research surveys off California have caught more opah in recent years, but biologists are not sure why. Current conditions may be favoring the fish, or their population may be growing. Opah are not usually targeted by fishermen off California but local recreational anglers and commercial fisheries occasionally catch the species. The opah's rich meat has become increasingly popular in seafood markets. "Discoveries like this help us understand the role species play in the marine ecosystem, and why we find them where we do. It really demonstrates how much we learn from basic research out on the water, thanks to curious scientists asking good questions about why this fish appeared to be different." said Francisco Werner, director of the Southwest Fisheries Science Center. * NOAA Fisheries is an organization dedicated to protecting and preserving living marine resources through scientific research, fisheries management, enforcement, and habitat conservation. The West Coast Region of NOAA Fisheries administers fisheries programs along the coasts of Washington, Oregon and California; and in the vast inland habitats of Washington, Oregon, California and Idaho. They work to conserve, protect, and manage salmon and marine mammals under the Endangered Species Act and Marine Mammal Protection Act, and sustainably manage West Coast fisheries as guided by the Magnuson-Stevens Fisheries Conservation Act.